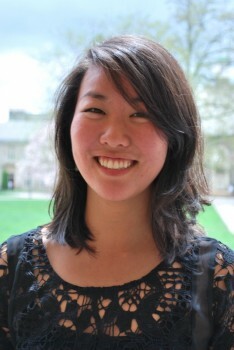 Clara Kang '13 has been awarded a Fulbright English Teaching Assistantship (ETA) to spend a year in Korea teaching English, starting in July. The English major and anthropology minor was born in Kwang-ju, Korea, and immigrated to the United States when she was 4, so she is especially excited to revisit her birthplace and practice her Korean language skills. Kang developed her passion for teaching in Instructor Heather Curl's classroom at Haverford and at internships across the country and around the globe. Earlier in her college career, she interned at 836LA, a Los Angeles nonprofit that inspires teachers and trains and tutors students in creative and expository writing. And last summer, she received Center for Peace and Global Citizenship (CPGC) funding to teach at Titagya Schools, a pre-primary school in a village in northern Ghana co-founded by Andrew Garza '08. The Fulbright English Teaching Assistantship places Americans in classrooms abroad to provide assistance to teachers of English to non-native English-speakers. These ETAs help teach the English language while serving as cultural ambassadors for U.S. culture. Kang was one of only 80 people chosen for an ETA in Korea. In addition to education, Kang is very interested in music. While at Haverford she sang in the a cappella group the Outskirts and played violin in the Bi-Co Orchestra. Though she will be busy in a classroom for six hours a day in Korea, she, therefore, also hopes to get involved with local children's choirs and other music education endeavors while there.